“Merck More than a Mother’s” efforts received big support in Finland from a high level panel of ministers, parliamentarians, academia, International Federation of Fertility Societies (IFFS), African Fertility Society and global fertility experts who called for action to improve access to regulated fertility care and empower infertile women in Africa through access to information, health and change of mindset. 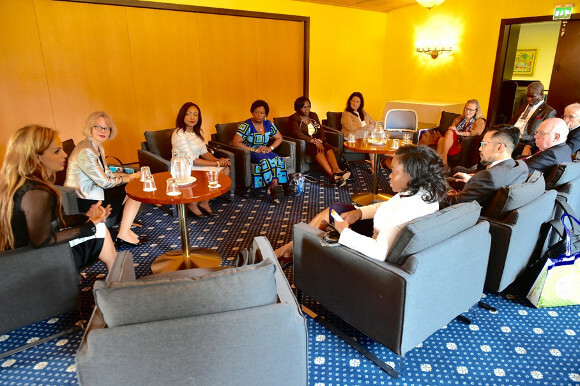 During the event that was held in Finland, a productive dialogue started to address the different angles of “Merck More than a Mother” initiative by the high level panel. The panel included, Dr. Belen Garijo, Member of Executive Board and CEO of Merck Healthcare; H.E. Sarah Opendi, the Minister of Health, Uganda; H.E. Betty Amongi, the Minister of Lands, Housing and Urban Development and Chair of Uganda Women Parliamentary Association; Hon. Senator Dr Lanre Tejuoso, Chairman of Senate Committee on Health, Nigeria; Hon. Joyce Lay, Member of Parliament, Kenya; Prof. Joe Simpson, President of IFFS; Prof. Oladapo Ashiru, President of Africa Fertility Society-Nigeria, Dr. James Olobo-Lalobo, Vice President of Africa Fertility Society-Uganda; Dr. Ivans Sini, Director of Indonesian Reproductive Sciences Institute (IRSI); Dr. Karim Bendhaou, President of North and West Africa, Merck Healthcare and Dr. Rasha Kelej, Chief Social Officer, Merck Healthcare. All the panel members agreed that “Merck More than a Mother” addressed successfully most if not all the angles relevant to infertility in Africa, such as creating a culture shift to respect and appreciate infertile women in Africa; raising awareness about infertility prevention and management and male infertility by integrating it into healthcare infrastructure such as HIV, maternal health and mother and child programs; education and training for African embryologists since lack of trained and skilled staff is a big challenge; defining ART policies to improve access to regulated fertility care; building advocacy and open dialogue with governments, policy makers, parliaments, healthcare providers and media; and empowering infertile women through access to awareness, health and change of mindset and empowering women who can no longer get pregnant by starting a small business for them to build their independent and happier lives through “Empowering Berna“ project. “Most women in the rural areas don’t know that the problem of infertility can actually be managed for many of them. Since we launched “Merck More than a Mother”in Uganda we have been trying as a country to integrate fertility care services and awareness about prevention, management and male infertility into the already existing reproductive healthcare services which will be cost effective as the infrastructure is already there,” said H.E. Sarah Opendi, the Minister of Health, Uganda. “In Africa, the issue of infertility is embedded in culture and also the wealth of most African countries is embedded in land and property. Therefore, culturally a girl child or a woman inherits from where she is married and when you don’t give birth you are supposed to go back to your home and when you do, you cannot inherit any property or land because your brothers and their children are the ones entitled to it,” explained H.E. Betty Amongi, Minister of Lands, Housing and Urban Development and Chair of Uganda Women Parliamentarian Association. “This leads to economic exclusion for infertile women. In Uganda, we are working on enforcing the law where women will equally inherit from their blood family so that they become independent and have the power of choice over their lives which will also help empowering infertile women in Uganda,” Hon. Amongi added. “In Nigeria, when there is infertility men believe that the woman is the problem. As a parliamentarian I will make sure that the “Merck More than a Mother” initiative will go everywhere including churches and mosques where people go for prayer when there is infertility so that the religious leaders can tell people to go for screening to determine if there is a medical problem first,” emphasized Hon. Senator Dr. Lanre Tejuoso, Chairman, Senate Committee on Health, Federal Republic of Nigeria. 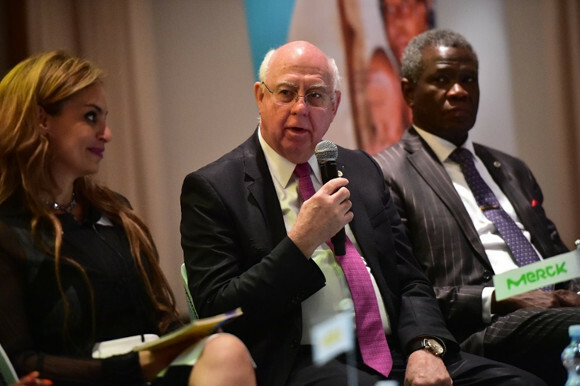 “We are looking forward to welcoming Merck in Nigeria to launch the “Merck More than a Mother” later in the year and I am happy to be the initiative’s only man ambassador. I will also introduce the ART bill in parliament so that we also join Kenya in having regulation in place,” he added. 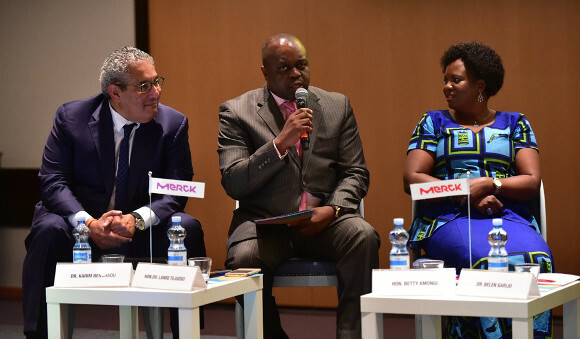 The event also marked the kick-off of the “Empowering Berna” Project and the Merck Africa Embryologists Training Program. She is now able to stand on her own feet after “Merck More than a Mother” helped her build a small local kitchen and cafeteria from where she cooks and sells food. “My suffering and stressful life is over now I am a new person. I can now walk with my head up knowing that I have a great business that will sustain me. I am very happy with this program and I wish that Merck can continue helping many other desperate people in this world,” says Grace. Watch the story of empowering Grace here. She has been provided with two cows to enable her become a productive member of society. Each of the cows is able to produce six liters of milk per day. From this she is able to earn about USD 6 from the sale of the milk every day. Watch the story of empowering Noonkipa here. She is now more independent and happier after “Merck More than a Mother”helped her establish a poultry project that now enables her to have a steady income to support herself. She has also been provided with the training needed to run and sustain her chicken business. “I am so delighted, I used to be useless and laughed at in this community. Nobody cared about me when I was sick. I am now happy, I am strong. I have strength all over my body,” Berna says while dancing with her neighbors. Watch the story of empowering Berna here. She has been empowered to start a restaurant where she can be able to earn about US$ 120 per month. Previously, Chinelo who is not only childless but also a widow was earning less than US$30 per month from providing tailoring services. Watch the story of empowering Chinelo here. “It is very important to empower infertile women through improving access to awareness and fertility care so they can bear children as part of their human rights. In case they can no longer be treated, Empowering Berna project will contribute towards empowering and training them to establish their own small business so that they can be independent and re-build their own lives, a woman is more than a mother, Empowering Berna initiative will prove this every day,” Rasha Kelej, Chief Social Officer of Merck Healthcare emphasized. “At IFFS we don’t only look at the success rate but we also look at guidelines, regulations and what prevents the success of fertility therapy. We also have basic trainings which we have in developing parts of the world on what any physician or health provider can do to determine there is infertility. We will work with “Merck More than a Mother” on this,” Prof. Joe Leigh Simpson, President International Federation of Fertility Societies said. 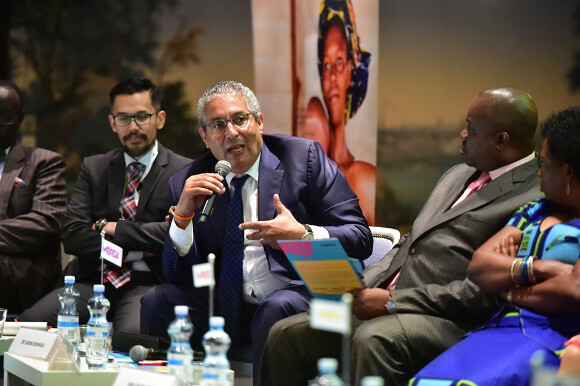 “The “Merck More than a Mother” initiative will energize my team to speed up in finding solutions to train and employ community based officers to provide essential primary healthcare at the village level,” said Dr. Karim Bendhaou, President of North and West Africa, Merck Healthcare. 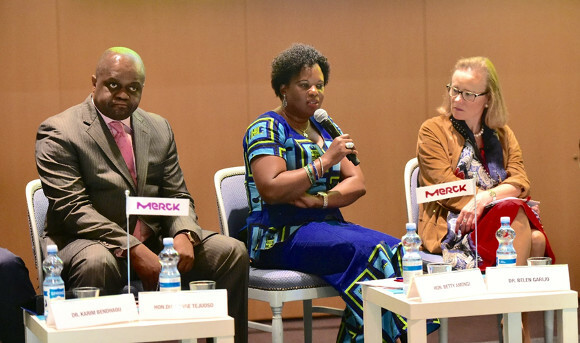 During the panel, the Merck Africa Embryologists Training Program was discussed. The aim of this comprehensive three months training program is to improve access to quality and safe fertility care across the continent. The training of African embryologists through “Merck More than a Mother” has already started in Indonesia at the Indonesian Reproductive Science Institute (IRSI) with two participants: Emmanuel Okullo from Uganda and Pauline Kibui from Kenya. “It has been very exciting being here for the training. It has answered most of the questions I had on embryology and also cemented my knowledge,” says Pauline Kibui. “We are excited to take the knowledge we have acquired here back home to our countries,” sums up Emmanuel Okullo about the training. Watch this video as Dr. Ivan Sini, Director of IRSI highlights the focus areas of the embryology training and as trainees Kibui and Okullo share their experience. Watch the long version of the high level panel of “MerckMore than a Mother” here.